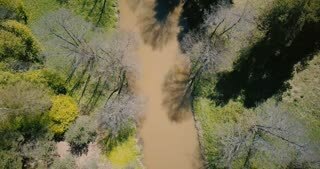 Drone flyover shot above springtime dirty stream. Aerial 4K perspective pov view. Beautiful early spring wild riverside. Drone flying close above early spring muddy river. Aerial 4K vertical view beautiful warm sunny springtime wilderness.